So how do you build a business where not a lot of people understand how you make money and many assume you're a not-for-profit that provides the industry with free research? The answer is simple: flood the market with a daily dose of insight and have everyone feel part of what you are doing. Make your information company open, social and collaborative; make everyone feel like they are a "client", even when they are not. Make people want to spend time reading your stuff and also invite them to weigh in with their views and opinions. In case you haven't noticed, we are producing over 30 awesome flagship Blueprint reports this year, each encapsulating an entire market, profiling and rating all the key service providers and defining the process value chain, the key trends and dynamics. That's the core 30 services markets in the industry across IT Services and BPO. That's a lot of research. On top of this, we produce service provider profiles, market sizing forecasts and a services price benchmarking service, PriceIndicatorTM , that is widely adopted by the services industry. Service buyers, providers and advisors all pay us subscription fees to access these services. 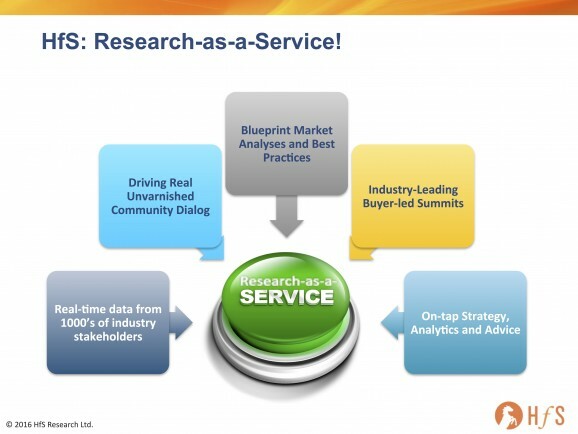 More and more service provider selection decisions, today, are being made with the insights from an HfS blueprint. You want to find out how to get value from today’s RPA platforms, or how much you should be paying to process insurance claims in Colombia, then call us up. But I have bad news for you - you'll need to be a subscription client if you want us to answer the phone. Our subscription clients get time allowances to have on-tap analyst support with their strategies - whether these are quick fire one-hour inquiries, or half day strategy sessions. We also do custom strategy projects from time to time, whether it's a new market assessment study, a marketing strategy review or simply interviewing buyers to write about their experiences. We attract over a million visits a year to our websites and have well over 100,000 subscribers who regular access our ongoing research insights. We are constantly conducting both quantitative and qualitative research studies with our network, which forms the lifeblood of everything we do - sharing real-time market insights and dynamics with our clients, and performing exhaustive interviews with buyers to learn about their experiences and the performance of their service providers. We also get an average number of 500-1500 people on our regular webcasts, which provide a genuine window to interact with our community and share research insights. At HfS, we diversify our business across service buyers, service providers, consulting firms and investors to make our money. The biggest issue here is that if you are restricting your firm only to selling to tech vendors/ service providers, your growth is restricted to a small universe of clients. If you can cater your research to tech users and service buyers, you have literally tens of thousands of prospects out there. And you have to be objective when selling to buyers - they know when your research is too biased towards your sponsors. Our golden rule is simple: if you're going to give something away for free, it better be worth reading! Enticing someone to give up their precious time to read your insights is one of the hardest things to do. If you can't create compelling insights, then just stuff all your "research" behind a paywall and invest heavily in sales people to convince clients it's worth signing up. However, if you can share a little bit of your experience up front, it's a much less aggressive sale when your prospects have already seen a glimpse of the goodies they will get when they sign up to the premium stuff. What's more, you can't build a global analyst brand in today's market, if no-one is reading your stuff, networking with your analysts at your summits, and listening to edgy and informative webcasts. What worked 10 years ago no longer works today. The big established analyst brands will survive because they are a destination amongst the confusing clutter of information and wannabe experts all putting their stuff out into the market. The second and third tier analysts are struggling - and some are fading fast - because they just can't command a global audience with a compelling research experience. I think the future of analyst firms is focusing on a full experience indeed > Analyst firms: rock star bands or record label dinosaurs? You have built an incredible analyst firm and have some great analysts. A big hat tip to you! Great articulation of your business. The HfS model leads the way in combining social collaboration and insight to disrupt an entire industry. This is a true digital story in its own right. Kudos to you guys! @Paul - thanks. It's only been possible because of some great people who've helped build this up. @Charyl - This is a fair question. The barriers to entry are a lot higher than you may realize in the analyst industry these days. When we launched in 2010, analyst blogs were all the rage and were the preferred vehicle for quick insight for many busy executives. As someone told me recently "HfS caught a wave and rode it". I hate to say this, but I doubt HfS would make it if we launched it today - the analyst market is awash with individuals (of varying capability) masquerading as analysts - some as analyst "firms". Most of these analysts are compensated by tech vendors for writing puff pieces / producing questionable "analyses" and assessments of vendor capability. While there are some brilliant people out there trying to make it as indie analyst firms (or just as individuals), the well has been poisoned by mediocre analysts who have come onto the market and tarnished the reputation of the industry. Plus, there is so much more information "clutter" these days - every day there are many new blogs and articles on LinkedIn from every man and his dog on "Digital Disruption" or some related topic. It is actually much harder to get your stuff read and noticed today, than it was 5 years' ago. So the reality is that leading analyst firms with established brands are increasing in credibility again in this era of information overload, automated tweeting and analyst puffery. Back in 2010, we were seen as a breath of fresh air in the analyst world with our open model and fresh insight - and the industry gave us time to get it right as we grew and experimented with the model, using contractors and part-timers in the early days when we had no money. Today we have a growing global team, offices in the US, Europe and India and a very strong sales/marketing/customer ops function - and we have done it all without external investment and being beholden to private equity. Great business model. It's the way you engage with your network that make HfS so powerful and influential in the market. Well done, Phil and team! Traditional model : There ain't no free lunch HfS model: Give free delicious Entrée and charge for the Main course. 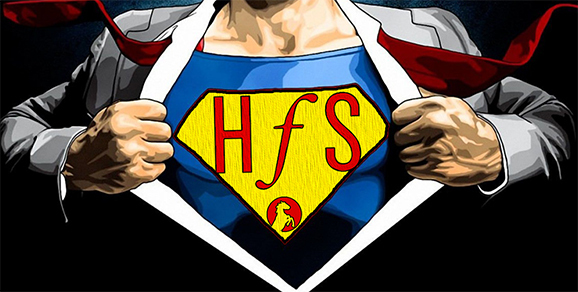 From my recent experiences, it's clear HfS has some really smart analysts and is doing some really good research. What I find interesting is how your business model seems to be very similar to those used by the big firms including Gartner. You've taken elements from the new world and the old world of analysts and seem to be building a business that is scalable in a way that many of the newer "disruptive" analyst firms have struggled to achieve.